CMU slides, 1979 (1 slide box). This box was left in the CMU Baseball office. One of the students there was taking my class and brought it to me because nobody there knew what to do with it. Thanks Logan! 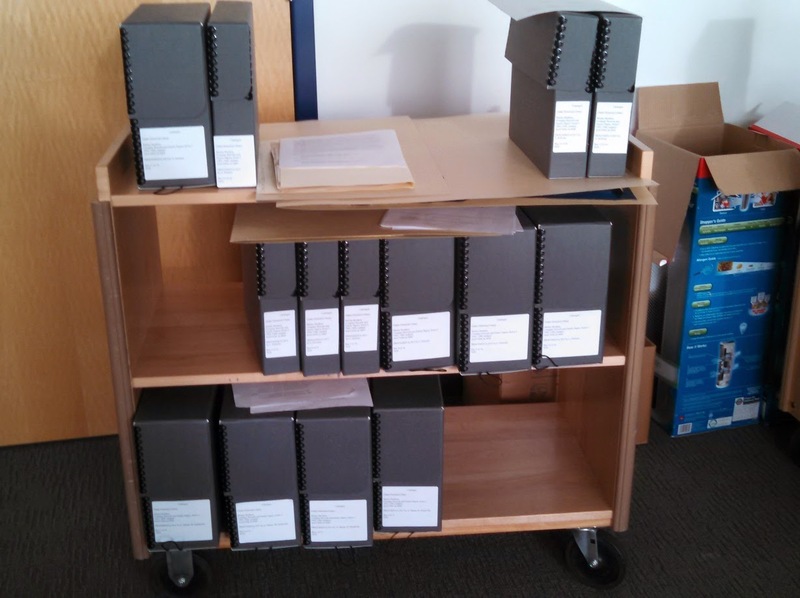 J. E. Howard correspondence, 1885-1895, 4 boxes (2 cubic feet). His Michigan railroads business records collection, 1846-1920 which totals 93 cubic feet (in 32 boxes, 276 Ov. v, 11 Ov. folders, 1 rolled item), is separately cataloged. And they processed all the loose paper records for Morley Bros. family and business records/papers (ongoing) 14 boxes, 1 folder, 2 Ov. folders (6 cubic feet). This is a large, complicated collection which has been processed by several groups of advanced students over several years. Currently, 13 boxes, 5 Ov. Folders have already been processed. At least 229 Morley Ov. volumes remain to be inventoried and organized. Their work this term is a notable achievement. Thanks to all my wonderful students for a good term -- Mark Prindiville, Alyssa Halula, Samantha Sullivan, Liz Edwards, and Gwyn Richard. Their work freed me up to process other collections, and catalog and encode finding aids for everything any of us processed. Mark and Samantha are graduating in May. We wish them the best! For more information about these collections see their catalog records and finding aids via Centra or the Clarke's finding aid page. Finding aids can also be found via a Google search. I am happy to take interns and volunteers at any time, except the last few weeks of a term. If you have any questions about working in the archives or would like a tour, or want to know more about these collections, or other collections, please contact me, Marian, at marian.matyn@cmich.edu. The Clarke Historical Library lost a good friend on April 16, when Robert Griffin died. Several news outlets have published lengthy biographies of the former United States Senator and Michigan Supreme Court Justice, but none mention that the Clarke has a special connection to the Senator. Bob Griffin, a CMU alumnus (1947), entrusted the Clarke with his papers. 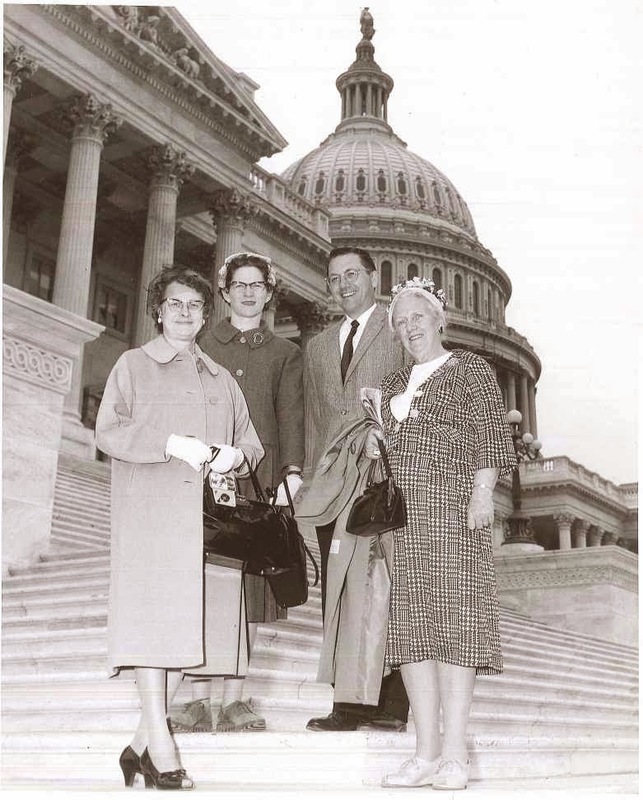 Today, we continue to preserve thousands of documents and photographs, and a great deal of audio/visual material that document the legislative and judicial legacies of Bob Griffin -- all of which is open to the public without restriction. 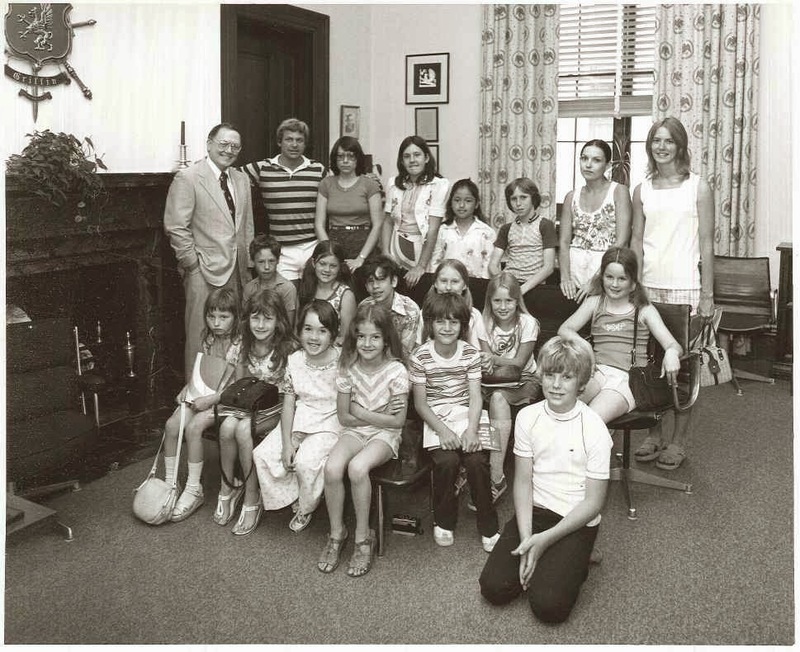 The Senator also served on the Clarke Historical Library’s Board of Governors. Bob was a source of much wisdom, good advice, and at least one very memorable story. At a Clarke Board meeting, I had the obligation to report that the Library had been threatened by lawsuit over information found on our website. A fairly detailed legal discussion ensued. The discussion reviewed advice from CMU’s Counsel which was, in short, that such a suit would be groundless. Throughout the conversation, the Senator remained silent, and when he was asked for his thoughts he simply said, “It would be best if the minutes reflected that I recused myself from this discussion.” This ended the official discussion. from Brooks Elementary School, Milford, Mich.
during their ca. 1976 visit to Washington, D.C.
Unsurprisingly, and unofficially, one of the first subjects to be visited over lunch was why “it would be best if the minutes reflected that [Justice Griffin] recused [him]self.” Griffin was still a sitting judge, and as it turned out, the likely reason the Library had been threatened with a lawsuit was that we had summarized inconvenient historical information that did not support a legal argument found in a suit the Justice was about to hear. Over a sandwich, Bob smiled and said, “but I did find your conversation useful.” I can only conclude that it was so, since the Clarke was never sued, and insofar as I know, that lawsuit quietly disappeared from his court docket. The Senator’s funeral is today, and we extend our sympathy to his widow, Marjorie, and his entire family. by Casey Gamble and Bryan Whitledge. Thanks to Victoria Fisher and Lindsay Gabriel for their research assistance. This year, April 9 marks the 150th anniversary of General Lee's surrender to General Ulysses S. Grant at Appomattox Courthouse, Virginia. This event brought an end to the Civil War. 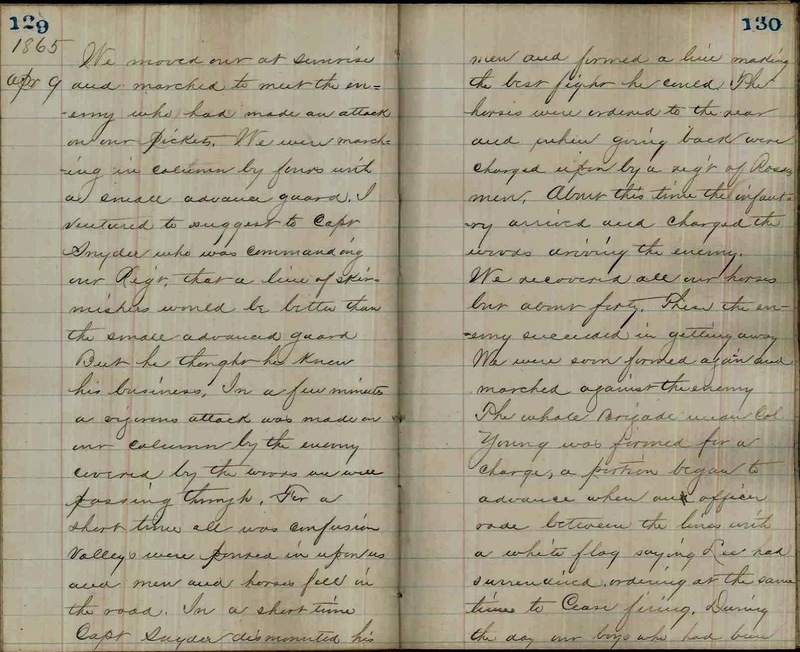 We dug into our Civil War Collection and found several diary entries and letters home from soldiers mentioning the surrender and the fact that the end of the war was in sight. Here, we are featuring a selection of these intriguing documents. Hance Morgan was a Union soldier from New York who began his service in 1862. During his years in service, he was with many different NY regiments. In the days prior to the surrender, Morgan notes that his regiment was moving toward the site of the surrender and that they crossed the Appomattox River. On April 9, Morgan remarked, "9 A.M. hear Cannonading a few miles ahead stop to rest. 12 N[oon] move on again haul into Park about 2 oclock, see a flag of truce wagon pass, said to convey Genl Lee. 4 P.M. Genl Lee Surrenders to Grant. Unconditionally. very great Enthusiasm amoung [sic] the Union Troops. Every Genl is cheered as he passes. Salutes are being fired by [Artillery]. our Battery with the rest." In another document, George Slaven, a member of the 18th Regiment of Pennsylvania Cavalry remarked "I was in camp the day was quite rainy. [T]hare [sic] was a salute fired this morning for the surrender of Gen Lee." In a third document, Theodore Carter of the 26th Michigan Infantry didn't have much to mention on April 9. The next day, his diary reads, "[N]ews of the surrender of Gen. Lee and his whole army of northern Virginia salute of two hundred guns from the forts around." 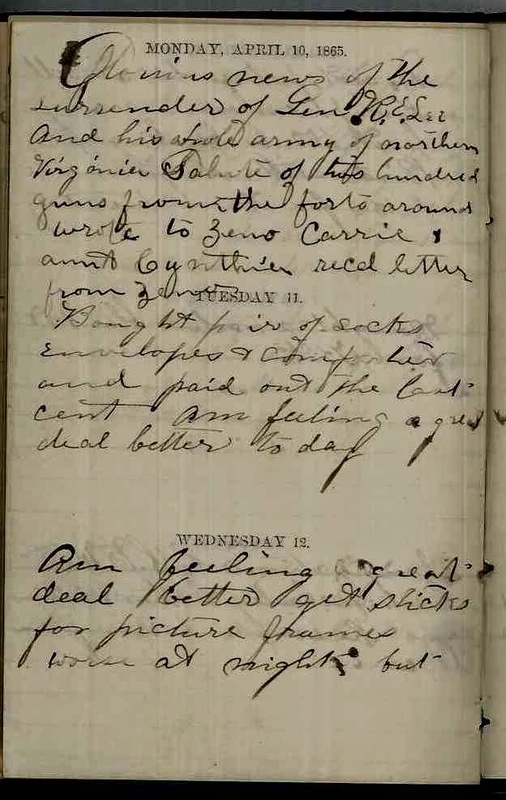 Seeing that the War was coming to an end, Carter writes on April 11 about the practical matter of disposing with his military store credits before he can no longer purchase goods: "Bought pair of socks envelopes and comforter and paid out the last cent am feeling a great deal better today." 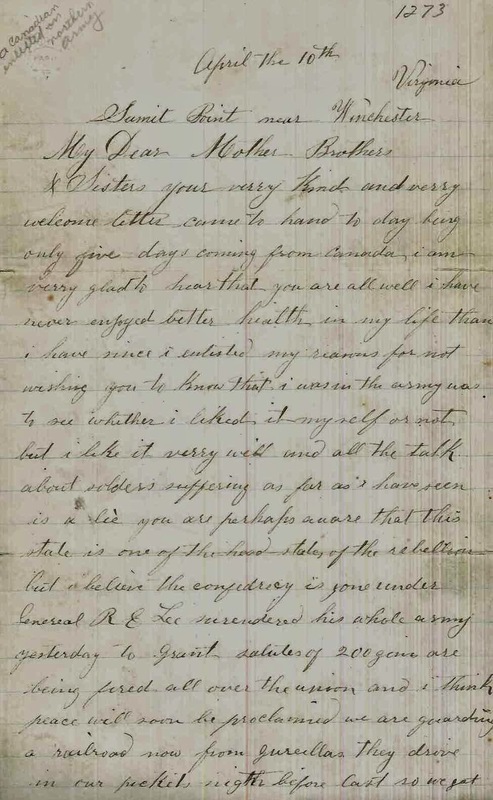 William Doherty, a Canadian fighting in the Michigan 5th Cavalry wrote a lengthy letter home on April 10, 1864, from near Winchester, Virginia. He writes to his family, "You are perhaps aware that this state [Virginia] is one of the head states of the rebellion but I believe the confederacy is gone under. General R. E. Lee surrendered his whole army yesterday to Grant. Salutes of 200 guns are being fired all over the union and I think peace will soon be proclaimed." "The whole Brigade under Col. Young was formed for a charge, a portion began to advance when an officer rode between the lines with a white flat saying Lee had surrendered, ordering at the same time to cease firing. During the day our boys who had been captured returned and among them came Genl Gregg. Every one seems very happy. Bands are playing their gayest pieces and all are rejoicing that this war is over. "Every fellow is writing home or to his best girl and if our mail bag holds all the letters sent, it will be a big one. Went down to Disputant Station to see Genl's Lee & Grant. Saw Grant, but Lee had gone away ere I got there." These young men's experiences, preserved in their diaries, are among the thousands that have survived over 150 years. It is their words that help to shape our view of the end of one of the bloodiest chapters in American history. 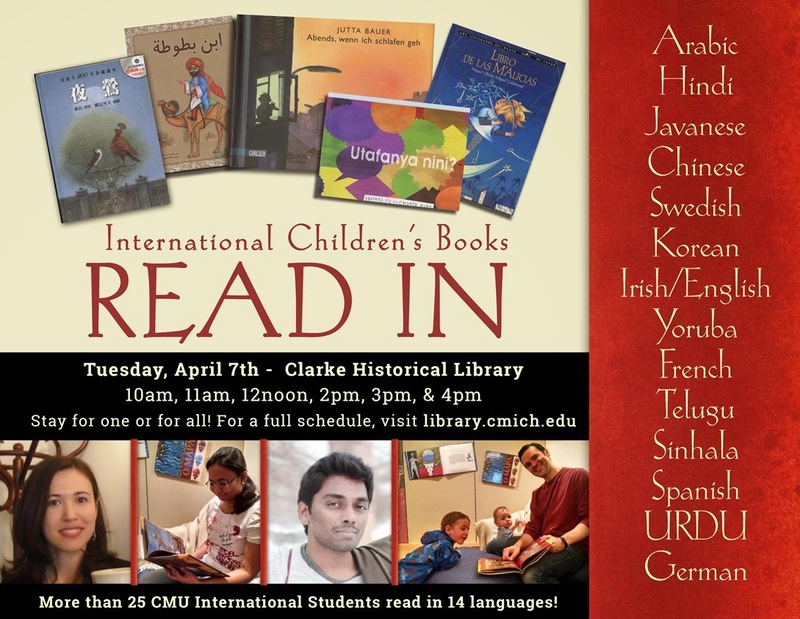 Tuesday, April 7, the Clarke will be hosting a "Read In" event in conjunction with our current exhibit featuring international children's literature. What better way is there to showcase the beautiful books in our exhibit than having these books read aloud in the language they were written in? Fortunately, on the CMU campus, we have students and faculty from every corner of the globe. 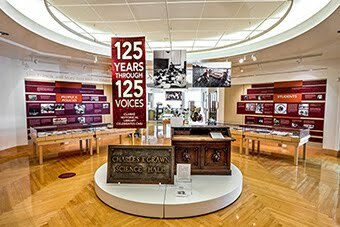 Over twenty readers reading in fifteen languages will participate in the event, which starts at 10:00 am and continues until 4:30 pm in the Meijer Gallery of the Clarke exhibit space. Books in Arabic, German, Hindi, Chinese, French, Javanese, Spanish, Yoruba, and many more will be read by native speakers of these languages. Check out this link for full details of the event. This event is free and open to the public and light refreshments will be available.